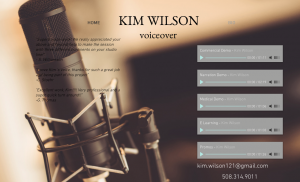 Kim Wilson provides reliable, high quality E-learning voiceovers. She has voiced numerous pharma and medical narrations as well as corporate E-Learning modules and white board animations. She specilaizes in a "friendly and down to earth" style that makes each brand relatable to the learner. She has her own broadcast quality studio equipt with SourceConnect for remote direction. The studio is equipt with C414 Mic, Ensemble Thunderbolt Apogee, and Logic Pro. She also has other mics available upon request. All files can be split and can be delivered in any format : .mp3, .wav or .aiff. "Superb voice work! We really appreciated your above and beyond help to make the session with three different continents on your studio line!" "Excellent work, Kim!!!! Very professional and a super quick turn around!!" Read reviews and discover other eLearning Industry community members's experience with Kim Wilson Voiceovers.